I'm going to let you in on a little secret today. It's a secret that was told to me years ago and I've never forgotten it. I was looking for steaks one day at my local grocery store for a special dinner I would be preparing that evening for friends. I couldn't decide if I wanted to go with Ribeyes or Porterhouses and kept picking them up and putting them back as I looked over the marbling in each pack. That's when I heard someone whisper, "go with a Hanger steak and you'll never look for those popular cuts again." It was my favorite meat cutter. He had come to my rescue so many times over the years in helping me pick the right cuts of meat as well as giving me tips on preparing them. I considered him my expert for all meat and poultry and fish. And now he was telling me about a steak I had never heard of. "What's a Hanger steak I asked?" He went on to explain that there was only one Hanger steak per cow and you will also hear it referred to as "Butcher's steak" because butchers and chefs have long knowingly saved this juicy steak for themselves. And it's about half the price of a good strip, porterhouse, or rib eye steak. Enough said. I took home my first hanger steak that day and have never looked back! My verdict? Forget tenderloins, porterhouse, ribeyes and sirloins....I'll take a hanger steak any day. It has been my favorite cut for all these years! It's a winner in every aspect. It's easy to cook and quite versatile, just a quick sear in a hot pan or on a grill is all it needs. 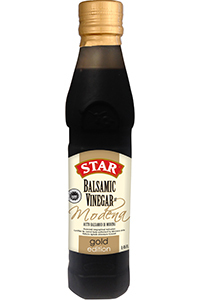 Today, I cooked up a wonderful Hanger Steak inspired by one of my favorite vinegars from Star Fine Foods, Modena Gold Edition Balsamic Vinegar. To marinate the steaks, in a bowl, whisk together the vinegar, garlic, shallots, bay leaf, coriander and thyme. Slowly whisk in the olive oil and lightly season with salt and pepper. Place the steaks in a baking dish and pour the marinade over them. Cover with plastic wrap and refrigerate for about an hour. Remove the steaks from the marinade and place on a wire rack to drain. Reserve the marinade. Heat a 12 inch grill pan or cast iron skillet over medium high heat. When the pan is hot, lightly brush with olive oil. Add the steaks to the hot skillet or pan and sear for about 3-4 minutes per side for medium rare. Reserve the marinade. Transfer the steaks to a cutting board, cover loosely with foil and let rest for 5 minutes. Remember the steak will continue to cook a bit while resting. Meanwhile, pour marinade into the same skillet over medium heat. Pour in 1/4 cup of red wine and bring to a boil. Turn down the heat to medium and allow to cook for about 5-10 minutes until sauce reduces. Remove from heat. After steak has rested, slice it against the grain into 1/2 inch slices. Spoon sauce over the top and serve. oh my, my mouth is watering for steak! thanks for the great tips. I have never heard of these steaks. I am going to look for them! thank you!